Water Resistance: Waterproof–Treated fabrics and specially designed zippers, closures, and seams completely seal out water and rain. Insulation: ThermaTech™–Mid-weight insulation delivers premium warmth. Breathable–Allows moisture inside the garment to escape and evaporate. Promotes air flow. 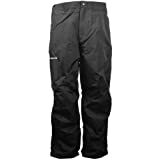 Head for the slopes and fresh powder with the Ski Gear Arctix Tussor men’s pant. It features a ThermaLock™ shell for wind- and water-resistant performance, while the ThermaTech™ insulation traps heat close to your body for exceptional warmth without the weight.